Hey everyone, my name is Joe, Reviews Editor for TechRadar, and I've never built a PC. Until now. Yes, I work for a technology media outlet and have never tangled my fingers in SATA cables. This is my shame. But recently all that changed. I've been a PC gamer for as long as I can remember, but the hand-me-down systems my parents received from friends and family were just enough to handle Wolfenstein 3D and later Star Wars: Tie Fighter. When Everquest hit, I needed a beefier rig, which took months of saving (and a little help from my parents). When World of Warcraft (my ultimate PC gaming obsession) came around, all I needed to do was buy a better graphics card (and have a surly fellow at the local CompUSA install it for me). Soon after that, laptops began taking off, with rising power and falling prices. That sparked my passion for mobile computing, and I didn't look back until a few months ago. All of the hype around the launches of the Xbox One and PS4 got me itching for a serious gaming rig at home. Despite their plug-and-play nature, I've grown tired of their walled gardens. I mulled over crafting a Steam Machine for a minute, but I wanted a Windows machine for the wide support. The reality of the situation grew clearer and clearer, I should just build my own gaming PC. And I needed to do it before the World of Warcraft latest expansion, Warlords of Draenor releases this November. It was time to put a part list together. Over the course of a few days, I pieced together a set of components that was as affordable and compact as I could make it, but also handle Warlords of Draenor at 1080p with all the settings locked at "high". And I'm happy to say that crushed it. The end result is a marvel. I've managed to assemble a box far thinner and not much taller than an Xbox One that lets me soar through Azeroth on a cloud of gigaflops at a frame rate that would make Peter Jackson blush. All for a total cost of just $486. This was after. Slightly better, right? That's before picking up a 1080p or Windows install. If you don't plan on hooking your would-be machine up to an HDTV or installing SteamOS, expect to add around $200 to that price. 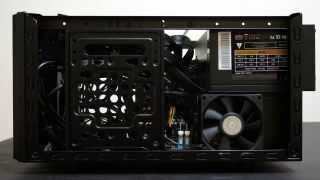 Click through to see the five things I wish I knew before starting my build that none of the PC building guides told me.